If you are looking for a French Canadian ancestor in Vermont, there is one website not to be overlooked especially if he lived during the Civil War era. Tom Ledoux’s Vermont in the Civil War is a real gem. You must check if your ancestor’s name is listed in this database—even if you are convinced it is useless. If you do find him, besides information on his age, military service and pension, you will learn if his name is associated with various Vermont towns (birth, enlistment, death, or burial). Additional information might include a gravestone picture. Definitely a must! For those who read the newspaper article earlier this week about Grandpa Tourville, I thought you might appreciate to see this picture of Joseph T. Tourville, a Civil War Private, in Company A, 2nd Cavalry Regiment, Missouri. Used with permission of the Missouri History Museum, St. Louis (item P0249-0954). And take the time to visit the Website of Missouri History Museum. There are real treasures hidden there! You may remember having read on this blog a few months ago about Adelia Tourville Pelky Ouimette claiming a pension for her late husband, Adolphus Tourville, who was a soldier in the New York 96th Infantry Regiment, Company F.
“My age is 57 last month; occupation dressmaker; residence and P.O. address, Ludlow, Mass. I claim pension as the widow of Adolphus Tourville, who served during the late war as private in Company F 96th NY Volunteers. He enlisted November 4, 1861 and was discharged March 18, 1863. This was his only service. He never served in the U.S. military or naval service prior to November 4, 1861 or subsequent to March 18, 1863. I was married to Adolphus Tourville August 10 when I was 15 years of age . I have not my marriage certificate, it was burned. I was not married prior to my marriage to Mr. Tourville. He was not married prior to our marriage to each other. Knew him six months before our marriage. I had a letter from his father and the priest of his parish setting forth that he was a single man before our marriage. I have not these letters now. I never knew or heard that he was married before our marriage to each other. 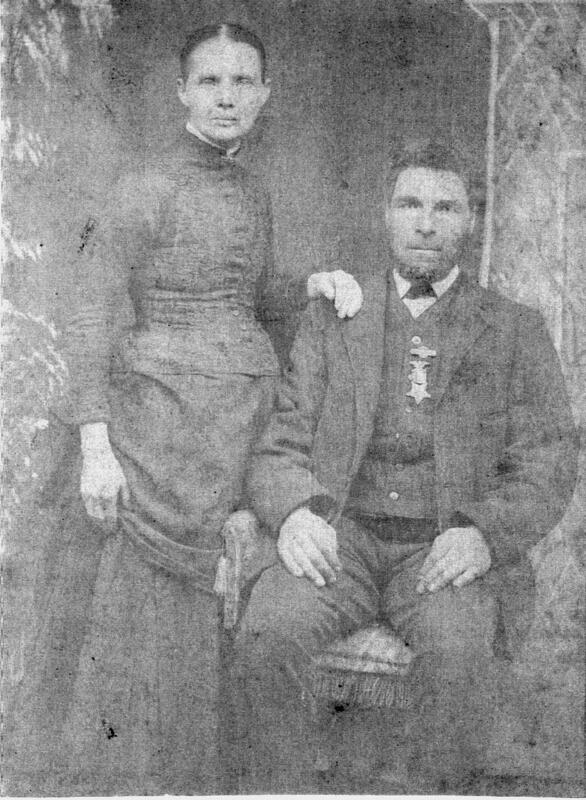 I remarried Andrew Pelky September 22, 1878. Andrew Pelky died July 4, 1895. I was married to my first husband by Father Sassville at Coopersville, NY. I was married to Andrew Pelky by Father Shyo the present priest at Champlain, NY. The oldest was born dead. The next was born dead. The youngest child, Bertie, died in May and my husband died the following January. My husband died January 4 [no record found]. I can’t tell the year. I think it is 19 years ago next January. There were four children living at the time of my husband’s death, i.e. Joseph Napoleon, Frank, Telephose and John Henry and these four are still living. I was not divorced from my first husband, I lived continuously with him from our marriage up to his death except while he was in the army. I was his widow from the time of my husband’s death until I remarried Andrew Pelky. I was remarried September 22, 1878 and if the record says that I was remarried on September 23, 1878, it is a mistake. I always called my second boy Frank. He was baptized under the name of Francis. The record of all my children’s birth and baptism is in St. Mary’s Church at Champlain, Clinton Co. NY. My oldest son is commonly called Adolphus but his right name is Joseph Napoleon. My youngest son’s full name is John Henry but we commonly call him Henry. Telesphore we usually call Tallas. I always considered September 3 my oldest son’s birthday. He is 34 years old last September. My husband died of lung disease which he contracted in the army. He had no lung disease to my knowledge before he enlisted. I never knew him to be sick at all before he enlisted. He had no cough nor any indications of lung disease before he enlisted. He was sound and healthy before he enlisted. My husband was born in Canada. He was 17 years of age when he came to the U.S. He was a carriage and house painter by trade. He said he worked in Massachusetts and New Hampshire before our marriage. We lived in Champlain, Beekmantown and West Chazy from the time of our marriage up to his enlistment. When my husband returned from the army, we were living in Champlain where we lived until 1866. We then moved to Napierville, Canada, about 18 miles from Champlain. We remained there 2 years. We returned to Champlain and remained there till June ’71. Then we moved to Isle of Mott, VT and remained there 2 years. Then back to Champlain for three years and then we moved to Keeseville, Clinton Co. NY where my husband died. My husband always followed painting. When he returned from the army he was sickly and for over a year he wasn’t able to do any work. He was confined to his bed most of the time. Every winter he was sick and unable to work. I do not know why my husband didn’t apply for a pension before his death. He did apply about a year before he died but he never heard anything from it. Mr. Bordmont of Keeseville was his attorney. He had a cough from his return from the army until he died. He raised phlegm all the time. 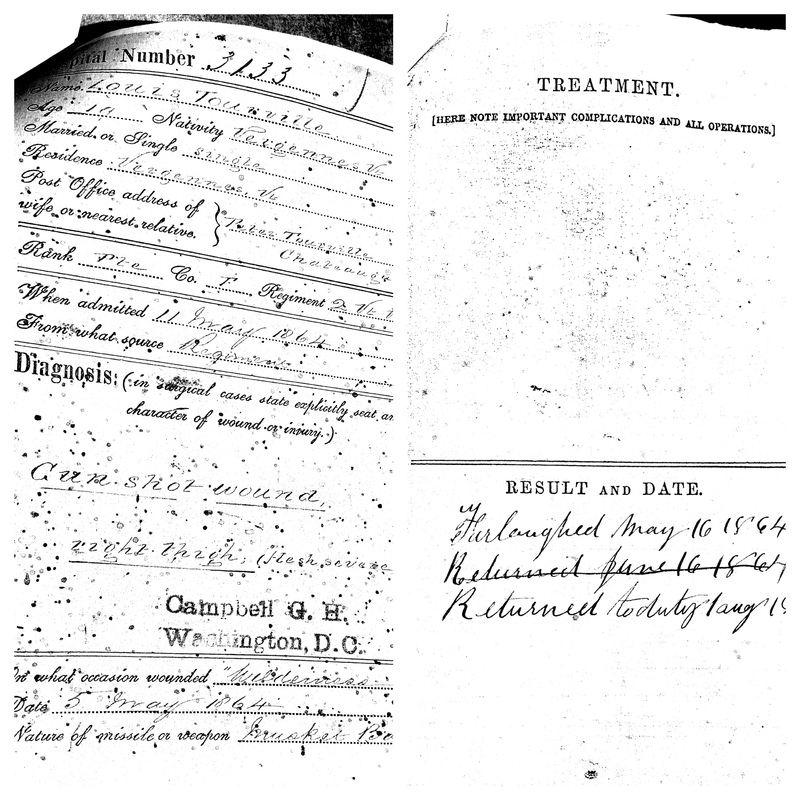 The doctor told me that he died of the same disease that he had in the army, Dr. Toby of Keeseville, NY. The first doctor that treated my husband after his discharge was Dr. Daggett of Champlain, NY now dead. He was next treated by Dr. Churchhill of Champlain, NY. also dead. Then he was treated by Dr. Toby of Keeseville, NY. Dr. Toby attended my husband in his last illness. He resides now in Keeseville, NY. These three doctors are all that my husband ever had. I never knew my husband to be sick or have any medical treatment before he enlisted. My husband drank before and after his army service. He drank to excess some before he enlisted but not so much after his return. Q: By whom can you prove that your husband was a sound man and free from lung disease before he enlisted in the army? I don’t know who examined my husband at the time of his enlistment. My husband took cold and had the lung fever while at Plattsburgh, NY before going South. I went to see him there and found him in hospital. I don’t know who treated him in hospital. It was in the winter time that I saw him at Plattsburgh and the following March he went South. He was sick and in hospital all winter at Plattsburgh. He was home 3 weeks recruiting up before going South. He wasn’t well but he gained enough to go with his Regiment. The doctors in the hospital told me what to do for him. I put poultices on his side and gave him the medicine which the doctors in the hospital ordered for him. Q: By whom can you prove that your husband contracted his fatal disability in the U.S. service? I think these four were well acquainted with my husband in service and would know of how he contracted his lung disease. He told me he contracted it by standing on picket while at Plattsburgh, NY. Q: By whom can you prove that your husband suffered from his lung disease from his discharge until his death? Drs. Toby and Farlay of Keeseville, NY, were in partnership and both attended my husband, principally Dr. Toby. Of my declaration for pension, filed February 7, 1890 says that I was then 56 years old it is a mistake, I was 57 years of age last October. I was married under the name of Adelia Centerber. I do not wish to the present or be represented by an attorney during any further examination of my claim. Since my husband’s death I have resided in Champlain up to last August when I moved here. Wasn’t I lucky to find such a testimony years ago? Story to be continued in an upcoming post on Adolphus Tourville. Source: Pension file claim filed by Adelia Pelky on February 7, 1890, Application No. 414408, National Archives, Washington, DC. Nelson LaCount is the son of Antoine LaCount and Catherine Tourville. He was married to Geneviève Brouillard. They lived in Chateaugay, Franklin County, NY. They are both buried in St. Patrick’s Cemetery in Chateaugay. This couple are the ancestors of Clay LaCount. I owe to this gentlemen the discovery of where some Tourvilles people settled in the United States. Clay has this picture and he is not sure if this couple is Nelson and Geneviève. According to family lore the medal that Nelson is wearing would be the one of his son who fought in the Civil War. Even if the photo is not very good, would anyone be able to identify what was that medal for? Would this couple be Nelson LaCount and Geneviève Brouillard? Any idea what this medial represents? Two young men. One from New York, the other from Kentucky. 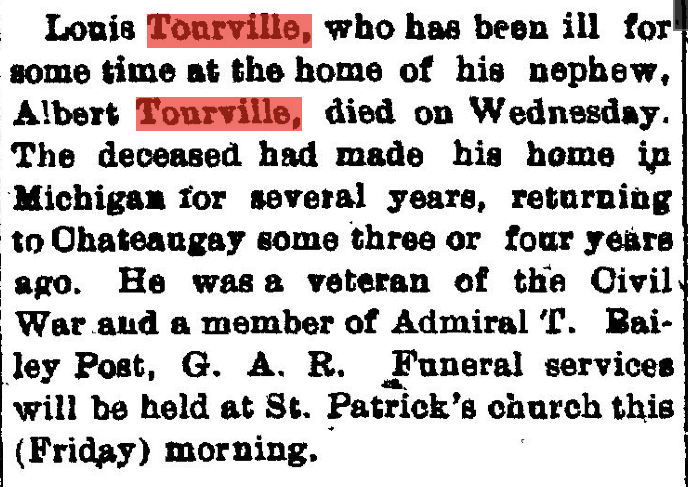 Their names were almost the same as Frank Troville was also known as Frank or Francis Tourville. Both born in 1844, both enlisted in the Civil War in a Cavalry Regiment, both died in 1864 in the same state. In Andersonville, Georgia. Frank Troville was born in 1844 in Vermont. His parents, Narcisse Tourville and Celina Durand (or Francis Troville and Adelina Durand in the United States) were married in Quebec in 1838 but soon left for South Hero, Vermont with Francis’ parents. They later relocated in Plattsburgh, in Upstate New York around 1853. On February 10, 1864, at age 19, Frank Troville enlisted in the Civil War in Beekmantown for three years. Little he knew that less than eight months later he would be dead. Mustered in on March 4, 1864 in the New York 16th Cavalry Regiment, Company L and made prisoner of war on June 24, 1864 near Centreville, Virginia, his family was informed only three months later, on September 19, that he was taken prisoner. He died of scorbutus on October 24, 1864 at Andersonville Hospital. He was admitted there on October 18. The details about the life of his “twin”, Frank Tourville, from Illinois, are not so clear. He was born abt 1844 in Alabama as well as his mother (according to the Illinois 1860 Census). However, his mother is said to be born in Kentucky in later censuses. I always thought that Frank was the son of Peter Tourville and Nancy Irwin. The Civil War pension application made by his mother reveals an important detail: she was his foster mother. The pension application was rejected on that ground. So maybe he was born in Alabama after all but we will probably never know who his biological parents were. According to his obituary, Peter and Nancy were married in February 1839. It was a second marriage for Peter. His wife Marie Aspace gave birth to a girl in 1838 in Florissant, Missouri, so we can assume that his first wife died between that birth and his second marriage. In the 1860 Census, Francis (or Frank) is living alone with his adopted parents in Jersey County, in Illinois. Peter has moved from Missouri to Illinois around 1849. Both died there in the 1890’s. Frank Tourville enlisted in the Civil War on December 14, 1862 in Lebanon, Kentucky, his place of residence at that time. Mustered in on April 16, 1863 in the Kentucky 11th Cavalry Regiment, Company E, he was declared absent without leave from April 18, 1863 until his return on May 1st, 1863. 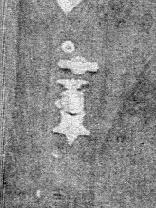 He went missing at the battle of French Broad, in East Tennesse, on January 28,1864. He was declared as having died in Andersonville during the month of March 1864. 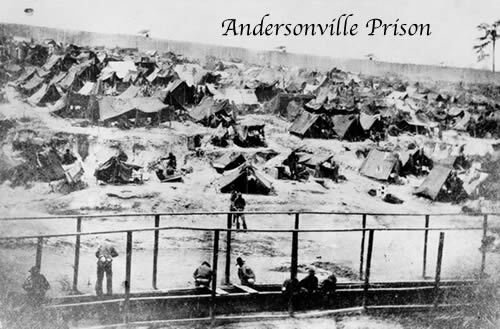 By being prisoner at Andersonville, our young men did not have much chance to survive. The numbers talk: Of the 45,000 Union Army soldiers held prisoner at the camp during a period of 14 months starting February 1864, 12,913 have died.